The African buffalo, also known as the cape buffalo, has two distinct subspecies which look so different they could almost be different species. The savanna and forest buffalo, as they are known, live in different habitats. Because of this, the animals have developed physical and behavioral adaptations to survive in the various habitats. Both subspecies also share several adaptations. Living out on the open plains, the savanna variety of cape buffalo has adapted to be large and powerful. The forest buffalo is smaller, living in a more space confined habitat. 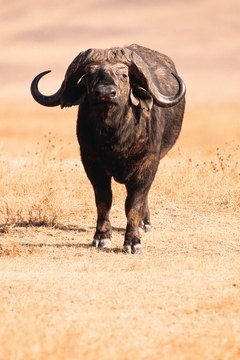 The forest buffalo also has adapted its horns to face backward instead of forward like the savanna buffalo. This helps it avoid getting tangled in tree branches. A large tuft of hair at the tip of the tail serves as a fly swatter to keep biting insects off of the animal's hindquarters. Hearing and eyesight is weak in the animals but the sense of smell is well-developed. The powerful leg muscles in adult buffalo means they can sprint at speeds of 37 miles per hour. The buffalo has adapted a relationship with some African bird species such as the oxpecker. These small birds sit on the large animal's back and pick ticks, lice and flies from the skin and help give relief from these biting insects. Although the animals have poor hearing, they do communicate with grunts and bellows. Male buffalo use the large horns to fight each other to establish dominance. The male's horns are connected by a boss, while the female's horns are separate. As a member of the Bovidae family, the African buffalo is a well-adapted herbivore. The animal has flattened molar teeth that help crush and chew fibrous plant materials that make up its diet. Specific bacterias, fungus and protozoa within the animal's digestive system help to break down the cellulose in the plants. They also have a four-chambered stomach which helps to extract every last bit of nutrition possible. Almost constant grazing is also important to meet the energy requirements of such a large animal. Living on a continent with so many large, powerful predators, the African buffalo has to adapt to survive. The pure size of the animal and its protective horns are a major adaptation against predators. Aggressive personalities against predators also help to ward off danger. Behaviorally, the herding nature of the animals is also beneficial with some herds numbering in the thousands. If a member of the herd is in danger it will bellow and the rest of the herd will run to try and help. University of Michigan Museum of Zoology; Bovidae; Whitney Gomez et al.